Battery Doctor Android App - Really Helpful or Not? 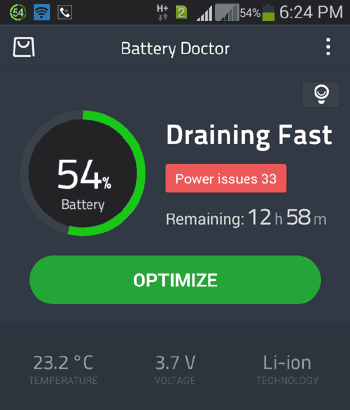 Battery Doctor Android App – Really Helpful or Not? Almost a week ago I installed Battery Doctor app in my Android phone to boost the battery life. I found it helpful but not for everyone. In fact, if you know most of settings in your smartphone like changing display settings, disabling apps, terminating background apps, then this app is not likely made for you. However, there are many other features of this app that may be helpful for you. So, today with this article, I will show you what are the plus and negative points of Battery Doctor app and how much helpful it is for you. Before giving you access of these pros and cons, I also would like to clear that I came to know about these pros and cons in just a week of utilization of this app so I strongly need your opinions too about this app. First of all, I would like to discuss the pros of having this app in your smartphone and then I will show you the negative points. You can setup the low power threshold with the help of this Battery Doctor app. Disable unnecessary apps that drain your battery. According to the App Developer, its Save Power option at home screen (on tapping) kills power hog apps that are not currently in use to improve battery life. Worth reading charging and battery saving tips. “Saving Mode” is an extreme setting that shuts down all non-essential functions of your phone with exception of making phone calls and sending/receiving text messages. WiFi, Data, GPS, etc will all be shut down to ensure battery life and defend your juice. The app also tell you about your battery temperature, voltage and battery technology. These are the most important features of Battery Doctor Android app and I know they are what everybody need. Its Clean Master tool may also be helpful for you that Battery Doctor App recommends you to install. Now, it’s time to make you aware of the negative facts or cons of this Android app. I again say that these cons I’m displaying depending on my own observation. In fact, the following lines are just the reflection of how I found this app. As the the app developer described in its description that it can extend the battery life up to 50%, then SORRY I’m not satisfied with this statement because of the following reasons. First of all, the most of the features described above, can also be performed without the app by using the Android phone’s built-in settings. I can’t believe that it gives the accurate battery remaining time, because I often found it incorrect. For example it said me the time is remaining 12 hrs 58 min and after optimizing the power issues it will increase a few hrs but I found it totally false because what I see just after 1 hr that these 12 hrs 58 mins converted into 6 hrs 23 mins. I don’t know how, even I didn’t utilize more battery. Sometimes gives the false details of power consumption by apps and shows the zero consumption by itself even if it consumes the battery as well as memory. The app always keep running in background even without staying for a while and consumes RAM. However I found a few negative points in the app but also utilized many helpful features as mentioned above (in pros section). And I’m also not sure that the problems occurred in this app on my device, will also be occurred for you. So, I recommend you to install this app in your device and try it once as it is widely popular. If you find it worth helpful for saving your battery, keep it in your device. As I stated already that the whole article depends only on my own experience and observation, so guys I would like if you to give a few seconds of yours to share your experience with this app so that other readers could know more about it. I thank you Raman for such a great review. It’s very helpful. With the reference to your review and user comments, I think it is not that useful. I am changing my mind to install it as I was thinking that it will really work like a doctor for my phone battery. I don’t think it’s beneficial to save your battery in Android phone. I used it for some days and didn’t find any positive changes in saving battery. So I uninstalled it very soon. Thanks for this fantastic review of battery doctor app. I got your point.